We Texans have a great love and appreciation for Mother Nature. So, it’s no surprise we love spending our days on some of the best hiking trails in America. If you’re looking to explore glorious trails through scenic backdrops, Texas can provide it. Trust us, these hiking trails will take you on journeys you’ll never forget, and will give you something to add to your bucket list. At this park, you will get to enjoy all the beautiful changing colors of the season while going on your hiking adventures. Take a trip out to a place also known as the “little Vermont” of Texas, just five miles north of the city of Vanderpool. 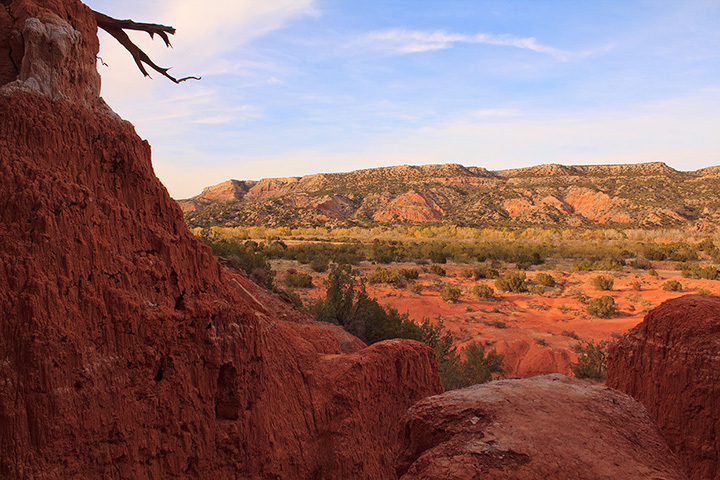 Palo Duro Canyon’s amazing colors of red clay and mountains dance across the blue skies when you make a visit on a sunny day...lucky you! It’s usually always sunny in Texas. Here, you can map your days out to cover over 30 miles of hiking trails! At Colorado Bend State Park, you’ll find yourself surrounded by canyons, unique flora and fauna and mystical waterfalls, one of which is the 60-foot Gorman Falls. Throughout this beautiful scenery, you can expect to cover 32 miles of hiking trails. Big Bend National State Park is clearly a hiker’s true love come true! There are over 150 miles’ worth of hiking to be had, with hills and landscape that reminds you of something right out of an extraterrestrial film. You must check it out for yourself. The Balcones Canyonland Preserve covers a pretty good chunk of central Texas. There are hiking trails with markers and suggested directions to take throughout the trail. This could be a very good start for new hikers and those who aren’t ready for rigorous hiking on hot Texas days. If you’re really into bugs, crawlers, and other fuzzy creatures, Big Thicket National Preserve is your place to be. Stay on the path of your choosing (eight different hiking trails) and don’t get your goodies caught in the carnivorous pitcher plant along the way! Head on over to Pedernales State Park and hike up Wolf Mountain Trail for stunning views of the Texas Hill Country from 1,000 feet up. There’s nothing comparable to our good ol’ Texas sky. If you can’t make it up that high, you can always venture the Equestrian Trail. Hiking up Guadalupe Peak in Guadalupe Mountains National Park is not for the faint of heart. You’ll be hiking up 3,000 feet to reach the top, and it is certainly worth the sense of accomplishment as well as the 360-degree views! Alright, alright...Enchanted Rock it is! It’s like what the Eiffel Tower is to Paris or the Statue of Liberty to New Yorkers. You simply must go at least once in your life, hike it, snap photos and if you’re really up for it, do some serious rock climbing! The Four C National Hiking Trail at Davy Crockett National Forest is a must-do day trip with the family. It’s friendly for anyone of any age and not to mention, the serene views of towering Cypress and Pine Trees dotting the lake. Venture through 16 miles of hiking trails at McKinney Roughs Nature Park. Meadows, canyons, and the gorgeous streaming of the Colorado River are all legit reasons to make your way out there. Choose your adventure! Garner State Park’s hiking trails kind of remind us of something you’d see in South American jungles (minus the humidity). Eleven miles is a pretty long hike, but you’ll be rewarded with rocky terrain and amazing views of the Frio River. The many different hiking trails of the ever so famous Greenbelt are absolutely worth your time exploring. You can find folks biking, hiking, walking, running all in and through this nature haven. Rock climbing? Kayaking? Or just hanging out with a brew and your pups at Twin Falls? You get to choose how you cool off at the Greenbelt. St. Edward’s Park is an 80-acre park where you can go hiking, bring your dogs, and relax by the waterfall when you need a break from all of your exploring. There aren’t any super challenging hikes, so if you’re looking for more of a relaxing experience in nature, this is the place! Sam Houston National Forest is a popular spot not just for hiking, but also for families to camp and explore other parts of the park. Texas forests aren’t like the ones you may see on the East Coast or other parts of the world, but this one is definitely worth visiting. Bring your family! View more Texas Hiking Trails.